ARGENTINA is set to regain access for its beef into the United States for the first time in almost two decades after proving its sanitary credentials to the USDA. 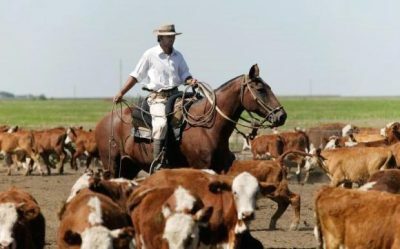 Gaucho moving cattle in Argentina. Argentina lost access to the US market in 2001 following a foot and mouth disease outbreak. It says the disease has since been eliminated from its livestock herd through vaccination programs. In 2012 Argentina launched a challenge against the US ban through the World Trade Organisation. Argentina international trade secretary, Marisa Bircher, told the Reuters news agency this week that all technical and administrative issues preventing Argentinean access to the US have now been resolved, and the USDA has deemed Argentine beef to be in line with US sanitation requirements. She said that had paved the way for a two-way trade deal between the two nations that will allow Argentina to export up to 20,000 tonnes of beef to the United States annually (similar to the quota of fellow South American beef supplier Uruguay), and will allow the US to export beef to Argentina, with no limit on its export tonnages into the country. Parts of Argentina are still FMD-free with vaccination, as opposed to outright FMD free. Industry sources have indicated to Beef Central that while the US has now permitted access to Argentinean beef, Argentina’s FMD status would not meet Australia’s strict biosecurity requirements. One of the reasons Brazil’s access to the US market was suspended in June last year was the alleged presence of vaccination “lumps” detected in Brazilian beef at the US border. The 20,000 tonne volume granted to Argentina represents a tiny percentage of the US beef market. The US imports close to one million tonnes of beef a year, and also consumes 90 percent of the almost 12 million tonnes of beef the US cattle industry produces annually (2017 figures). Of that production, 1.3 million tonnes were exported, according to USDA data. As such, the granting of access for 20,000t per year of Argentiean beef is unlikely to have a large affect on US beef market dynamics. However, the development represents an important step forward for Argentina’s aspirations to boost its export beef sales. Meat & Livestock Australia senior analyst Tim Ryan told Beef Central this week that, relative to the entire US beef complex, the 20,000t limit was a drop in the ocean and was not expected to have a significant impact on the market. By comparison Australian has tariff-free access to the US for 418,214 tonnes of beef per year. However, Argentina’s regained access to the US market is likely to help its campaign to regain access to other markets. “Argentina does still not have access to other high value markets where Australia operates, but meeting USDA requirements could be a step towards gaining such in future,” Mr Ryan said. Mr Ryan said Argentina’s regained access had to be considered within a broader transition taking place in the Argentine beef industry. Argentina liberalised beef exports and removed a tax on its beef exports following a change of Government in 2015. However, since then the country’s economy has plunged into economic turmoil and its currency has collapsed. One consequence of the cheaper Peso – which is now half the level at which it started the year – is that Argentine beef has become more competitive on the global market (although, as Mr Ryan points out, this has been partly offset by the introduction of some new export taxes to try to arrest inflation). Mr Ryan said finished cattle in Argentina are trading close to A$1.50/kg live weight, largely due to the currency devaluation, while finished prices in Australia are around A$3.00/kg live weight. At the same time, China has emerged as an importing powerhouse and a rapidly growing export market for Argentine beef. In the year ending June 2018, Argentine exports increased 54 percent to 266,000 tonnes with virtually all that growth destined for China, Mr Ryan said. He also noted that the Argentine domestic market is still very significant customer for Argentine beef. “It has a population nearly twice that of Australia, eating twice as much beef,” Mr Ryan said. While the US will gain unfettered access to the Argentinean market, the Reuters article suggested demand for US beef would be low in Argentina, a country famous for its quality steaks. The two-way trade deal has generated some concerns from sectors of the US cattle production industry. R-CALF USA chief executive Bill Bullard told Reuters he was concerned that opening the border to raw beef from Argentina would be certain to put downward pressure on US cattle prices, and meat packers would be able to use the cheaper, undifferentiated beef as a direct substitute for beef produced by US cattle producers.